In sports betting, two common forms you'll come across are point spreads and money lines. Once you understand how sports betting lines work, you'll see how easy they are to bet on and how they compare to points spread bets. What's In It for the Bookies? Is the Money Line Offered on All Sports? In fact, money lines are far simpler to work with than point spreads for the simple reason that the main concern of the latter is who wins and how much they win by, while the former is only concerned with who wins. For the serious bettor, this is just another aspect of placing sports bets. But to the beginner, it may not make much sense. So let's take a look at this simple principle and explain it in an understandable way. Let's start with a hypothetical example of a line bet to show graphically how it works and what you can expect from it should you decide to place a bet. Let's take a match between two fictitious soccer clubs; the favourites Bigtown United v Smalltown Rovers who are the underdogs. Money lines are generally expressed in £100 units, but of course you can bet as much or as little as you wish on any event. The payout will be reflected in the amount of the stake and calculated using the above expressions. The minus (-) sign signifiers the favourite, while the plus (+) sign signifies the underdog. What they mean is that if you wanted to place a bet on United, you'd need to wager £200 to win £100 (if United won). Conversely, if you wanted to bet on Rovers, you could wager £100 to win £150 (if Rovers won). If the match ends in a draw, the bet is considered a push. 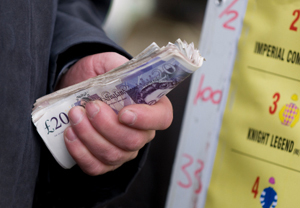 The bottom line for bookies offering any sports bet is they must end up in profit. They do that by setting the odds so that the favourite will pay out far less than the underdog to balance out the total amount of money wagered on either side. In general, the bookies will have a bad day if the favourite wins, although their losses on a single match will usually be marginal and when compared with their winnings of all matches on a certain day overall, will almost always be covered. But let's take a single match (as in our hypothetical example above) and look at how the bookies would fare depending on which side won. From the bookie's perspective, they need enough money to be staked on the underdog to cover their losses if the favourite wins. In this example, since most bettors will bet on the favourite team, let's say that £20,000 is placed on United, while £10,000 is placed on Rovers. If United win, the bookie would have to pay out £10,000. But since they took £10,000 in bets on Rovers, their total loss is nil. But if Rovers had pulled off an upset and won the match, a very different result would be enjoyed by the bookie. In this case, the payout would be £15,000 (£10,000 x 150 / 100) to bettors on Rovers deducted from the £20,000 the bookie took in United bets, leaving them with a cool £5,000 profit on the game. The main reason for using the money line is in sports where a points spread would have little value, such as with tennis, football, boxing etc where there is either only one winner or loser or the victory margin is very close, such as football where the most common result are 1-0 or 2-1. The difference in the money line odds is calculated by the bookmaker to make it most favourable for themselves and least favourable to bettors. The odds reflect the perceived chances each side has of winning the game, or which competitor has the best chance of winning the bout. The more strongly favoured the side or competitor, the shorter will be the odds to cater for a larger number of bettors favouring the most likely winner. You will see this as odds are posted and it will give you a pretty good idea of which side or player the bookies believe have the best chance of winning. In general, you will be able to place a money line bet on all sports, even those with a points spread available such as games with a wider victor margin such as basketball or American football for example. It is simply a means to provide bettors with more reasons to place a bet! 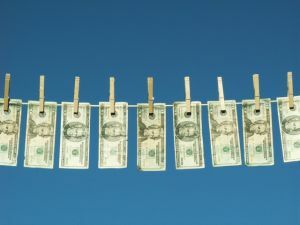 The line bet is also an important indicator for sports betting systems to use when calculating the best sports picks for their formula-based strategies. By incorporating these odds into the formula, betting system providers get a more accurate prediction model by using the bookmakers' own odds system against them. This is often seen in formulas like the Sports Cash System and Z Code System because it provides them with an additional metric with which to make their predictions and increases the accuracy by using bookmaker knowledge of likely outcomes, gleaned from the odds they set. As with all betting on sporting events, you should remember that nothing is set in stone and no result can ever be guaranteed. While the most favoured side or competitor has the best chance of winning according to statistics and form, what happens on the day can upset those delicate calculations. The underdog could suddenly finds an extra reserve of win-ability or the favourite could suddenly suffer a drop in form through something as simple as catching a cold or getting a bad night's sleep the night before the game! So whatever you decide to do when betting using line bets, remember not to get over confident and risk more than you can afford to lose, no matter how favourable a result looks to be. You can still lose as well as win, so be mindful of the limits of your bankroll and make sure you keep enough in reserve to be able to return to bet another day if you lose!